Entrelacs is a municipality in Matawinie Regional County Municipality in the Lanaudière region of Quebec, Canada. 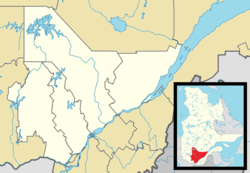 Prior to February 13, 1991, it was in Les Pays-d'en-Haut Regional County Municipality in the Laurentides region. The area is part of the geographic township of Wexford, named after a town and county in Ireland, and first settled by Irish colonists circa 1840. In 1860, the Township Municipality of Wexford was established. In 1967, it was decided to change the name to Entrelacs, meaning "between lakes" in reference to its position between Lakes Patrick and Des Îles. This name had already been used to identify the post office since 1889, but which closed in 1974. ^ a b c "Entrelacs (Municipalité)" (in French). Commission de toponymie du Québec. Retrieved 2009-11-25. ^ "Notre-Dame-de-la-Merci — Saint-Émile (pavillon Saint-Émile)." Commission scolaire des Samares. Retrieved on September 23, 2017. ^ "Rawdon Elementary" Zone Map. Sir Wilfrid Laurier School Board. Retrieved on September 17, 2017. ^ "SAINTE ADÈLE ELEMENTARY ZONE." Sir Wilfrid Laurier School Board. Retrieved on September 16, 2017. ^ "Joliette High School Zone Sec 1-5." Sir Wilfrid Laurier School Board. Retrieved on September 5, 2017. Wikimedia Commons has media related to Entrelacs, Quebec. This page was last edited on 29 November 2017, at 17:35 (UTC).